Why Hampta Pass? "I haven't seen a trek which packs so much in 5 days. You start of in a thick deodar forest, go above the tree line into one of the most beautiful alpine valleys, cross a spectacular snow clad pass into Spiti. To top this off you end up at the most beautiful high altitude lakes in India called Chandratal. And all these in 5 days! This is what makes Hampta Pass exceptional" believes Rohan Jain, Renok Adventures. Below are the 4 reasons why Hampta Pass trek is the best trek out there: Reason 1: Easy-Medium Trek Hampta Pass is not too difficult. On each day, there's not more than 6-7 kilometres of trekking. It's not too tough, either! Barring a few steep sections, the ascents and descents are mostly gradual. Reason 2: Normal Effort, Extraordinary Reward Nowhere in such a short distance do you have the chance to ascend to over 14,000 feet in such a relatively short span of distance. You get to experience the thrill of high altitude, by making an adequate amount of effort! Reason 3: It's Beautiful Right from the start of the trek from Jobri, the alpine meadows of the Himalayas quench your wanderlust. If you go early in the season(June), you'll get snow starting from Chikka. All around, the snow-capped peaks beckon you and motivate you to go further. Deo Tibba(6001 m) and Indrasan(6221 m) tower imposingly over the horizon. Reason 4: It's Necessary What do I mean, necessary? Just like the rungs on a ladder, you have to go step by step. 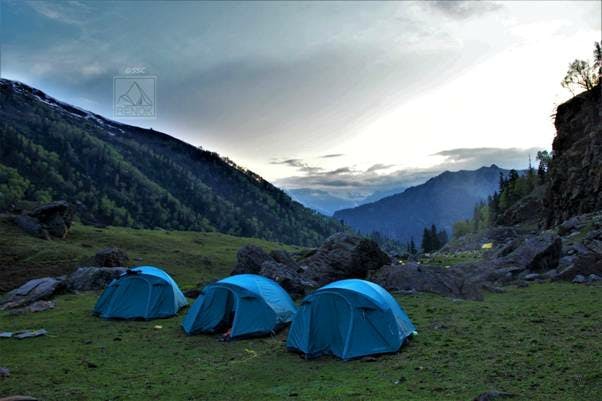 Now that you've done some easy treks like Kheerganga, it's time to take the next step on the ladder. Only after doing a trek like Hampta should one proceed to a tougher, higher trek like say, Stok Kangri. Therefore, it's necessary. Well, now that you've made up your mind, head on over to the Renok Adventures website to book an adventure with them. Hampta Pass Trek & other similar treks are organised by Renok Adventures.